With the flood of oil money, Dubai is a hotspot for construction with extravagant buildings being built on what was once a barren desert wasteland. The skyline has changed so much over the last 10 years compared to many other cities around the world, with ever higher skyscrapers being planned and built to wow even the most seasoned traveler. There is a new project coming up that not only ranks right up there where luxury is concerned, it will also boast architectural genius with the ability to generate up to 10 times the power it will use. Want to know more? Head on after the jump to find out. 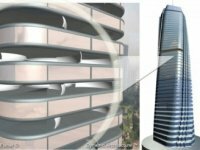 Each floor of Dynamic Architecture’s wind-powered rotating skyscraper consists of a single apartment with the unique ability to rotate independently, allowing residents to change the current view at the touch of a button. Imagine moving along to the sun’s direction as you attempt to hang dry your clothes – although with that kind of money to purchase an apartment like this you’d be better off using a dryer instead. Wind turbines peppered on each floor is capable of generating a surplus of electricity that will then be used to power the surrounding neighborhood. This new building relies on pre-fabricated segments before being put together, making the entire construction process totally radical from what is being applied at the moment. Not only does this make it more secure, it also lowers the overall cost as well as construction times by quite a significant amount. I wonder whether existing buildings around the world will be able to be retro-fitted with such power-generating capability. The rotating tower will begin construction soon, with the final product boasting 80 floors at 420 meters in height. Imagine each city center featuring a few buildings such as these – we won’t be suffering from an energy crisis then, at least for a while. There are currently talks being held to construct similar buildings in the cities of Milan, London, New York, Hamburg and Sao Paolo.